You’ve been patient enough, friends. 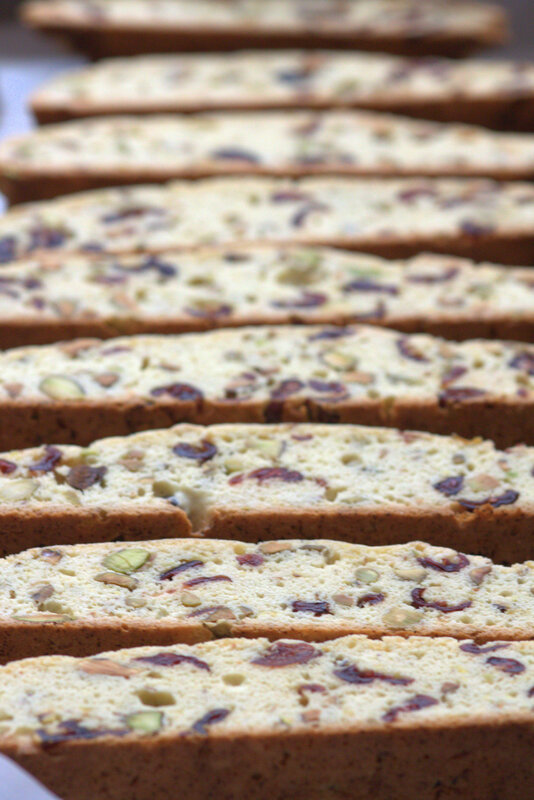 I know you’re all hanging in the balance, wondering which biscotti recipe won the hearts of all the taste testers. Well, perhaps you’ll have a chance to decide for yourselves, because today I bring you: Cranberry Pistachio and White Chocolate Biscotti! 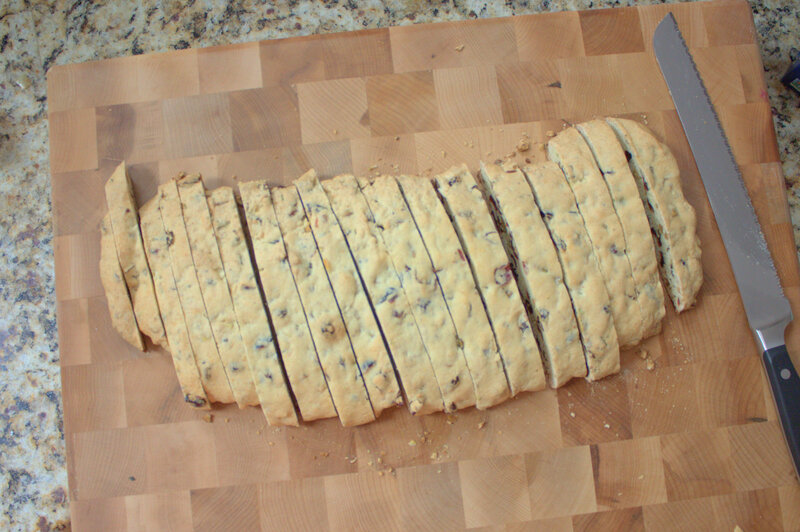 The first recipe I posted on this topic (Orange Cranberry Biscotti) tasted a little bit more “cookie-like” to me, while this one fit my more traditional definition of a biscotti. When I bake biscotti, I intend to dip it in something. (Hot coffee would be my first choice – regular for breakfast, or decaf if you’re serving biscotti after dinner.) Hence, a nice crispy cookie is just fine with me, but I often find that people are put off by having to work too hard to bite into their biscotti. 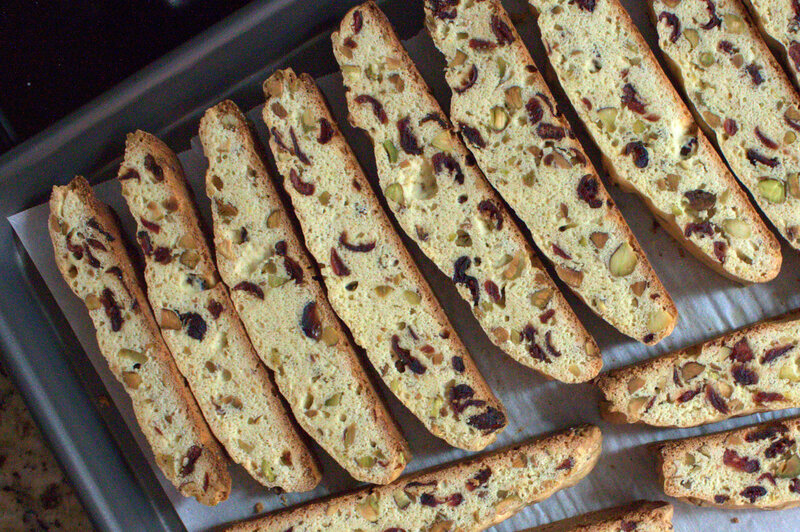 Cookies should not equate to work, so there’s no pressure from me to choose a crispy biscotti. So ultimately, when I make some variety of cranberry biscotti again, what am I going with? I’m planning to use this base recipe to create the drier cookie, but I’m toying with adding a little orange zest next time. On a side note, in order to tell these biscotti apart more easily, I varied my use of white chocolate. My Orange Cranberry Biscotti just had a neat little drizzle, whereas these biscotti received a full dipping. Once again, where does that leave us? For me, white chocolate is a little too sweet. I would either leave it off next time, or go with the subtle drizzle. 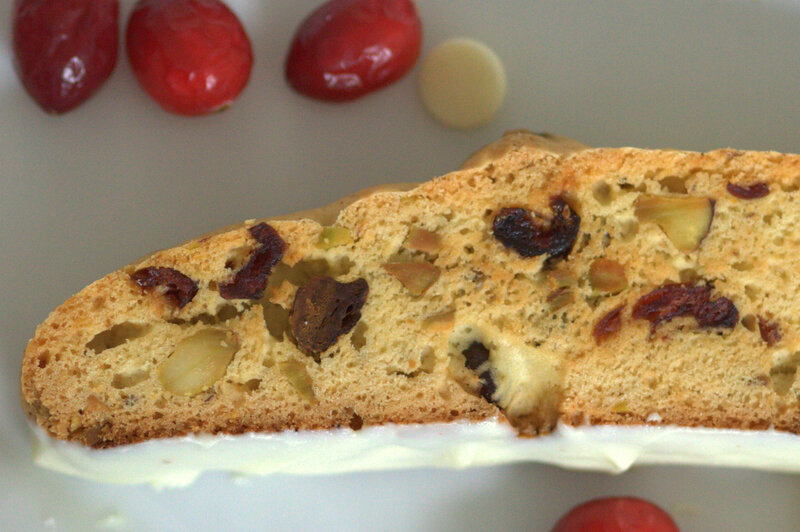 So there we have it… a game plan for the perfect theoretical Orange Cranberry Pistachio Biscotti – a recipe that has yet to be created/tested, but so far exists in our minds as a hypothetically perfect cookie. In any case, I’m sure you’ll want to see for yourself. 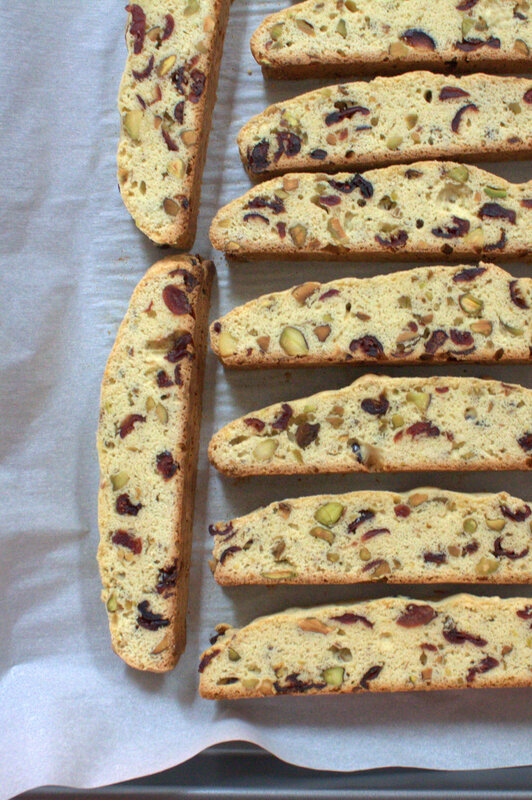 To find the recipe for these Cranberry Pistachio Biscotti, follow the link to Fake Ginger, the food blog where I found them! I wish I liked coffee. Maybe a dip in hot chocolate would work too. I am trying this TONIGHT! Sounds too good to be true. I love everything you included. I’m going to do a drizzle of the chocolate like you explained, since the ladies enjoy what I [a sugar & chocolate lover] would call plain flavors. Lol. No really, thanks for sharing this! So excited!! I can’t wait to give this recipe a try! I love all of those ingredients, and so does the lady friend, except she’s boring and won’t like the chocolate. I will just do what you said and lightly drizzle [I LOOOVE CHOCOLATE!]. Thanks for the info! Tonight, I’ll be a bakin’! 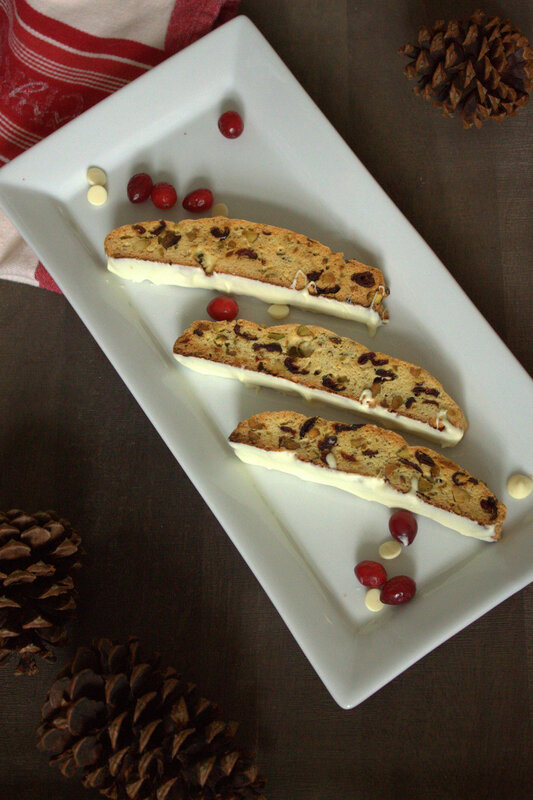 Maybe you can help us get to the bottom of which cranberry biscotti recipe is best!